Fantastic photo. One of my new favorites. Well done!!! One of my favorites, too! And thank you for the commentary — I really needed this message today. Clarity is always nice. Wonderful shot. The color of her clothing against the rocks and dirt around her is great. But it\'s the true joy that comes through in her smile that makes this such a special photo. I\'ve just loved this pix, the inocent bright face & candid expression of joy in her face. Really really awesom pix & Gr8 photography. Just Beautiful!!!!!!!!!!!!! 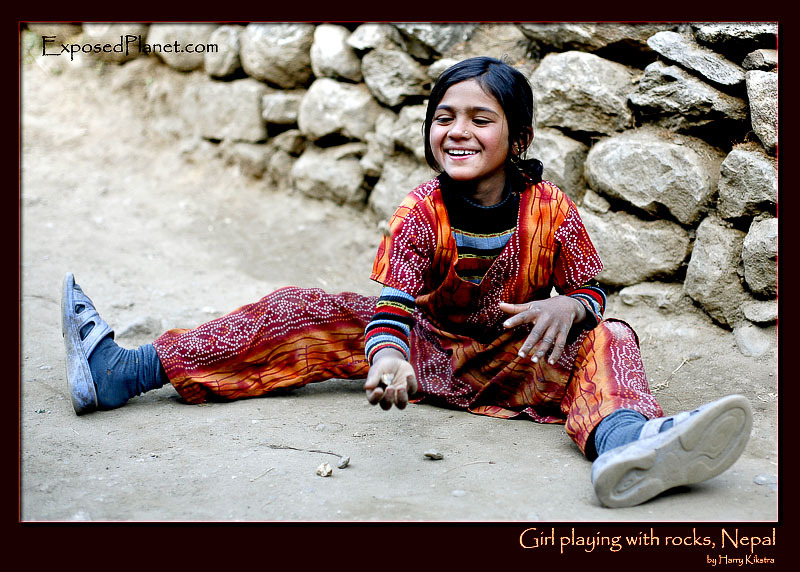 The story behind "Girl playing with rocks, Phakding, Nepal"
What if you are born in a society where electricity and clean water are not things that come out of the wall? Where Playstations & Nintendos are not sold by the thousands and people do not sleep outside – by choice- to buy one? Well, if you are a kid in Nepal, you play with what is around you. Pieces of dirt, branches, your friends or just a few small rocks. I watched this girl for many minutes playing with the handful of rocks and pebbles. Throw one up, grab the rest and catch the one in the air. Again. And again. She noticed me, but did not let me disturb her play and she was amazingly cheerful and dressed in the wonderful Nepali style. Only when I sat down next to her, she smiled directly to me. Her smile went to a full-power laugh, when I tried to join her in her game as she was much better than I was.